Alkyl porphyrins, tetrapyrrole molecules substituted with various alkyl chains have been found in the wide range of sedimentary rocks. Their chemical structures containing an exocyclic ring are strongly suggestive of derivatives of chlorophylls produced by photoautotrophs. The structure in such sedimentary porphyrins is far more variable than the original chlorophylls (i.e., chlorophylls a-f and bacteriochlorophylls a-g). However, the careful consideration of the structure of these alkyl porphyrins implies the original chlorophyll species, suggesting the photoautotrophic community in ancient times. Furthermore, both carbon and nitrogen stable isotopic compositions (i.e., 13C/12C and 15N/14N ratios, respectively) of these porphyrins provide significant information on the physiology and biogeochemical processes when the molecules were formed, leading to understand the surface ocean environment in the ancient time. 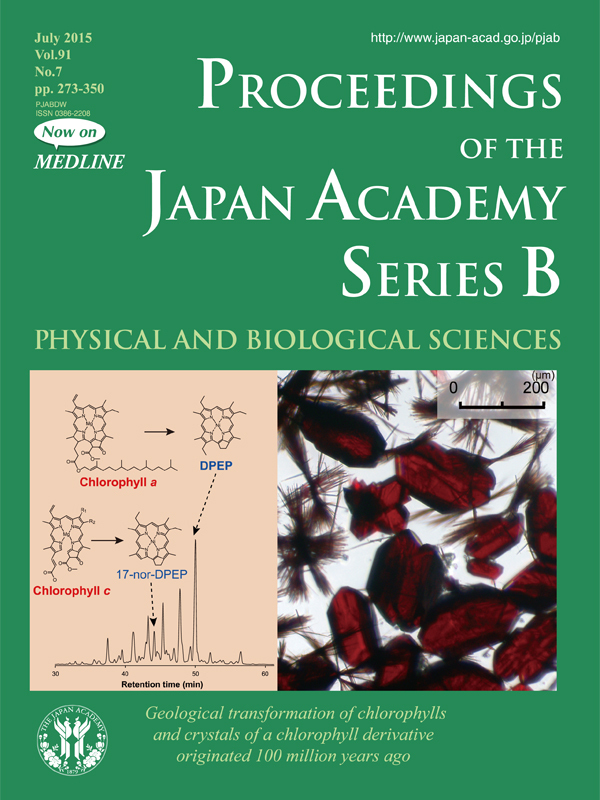 Cover illustrations indicate an HPLC chromatogram and the crystals of one of these alkyl porphyrins isolated from the carbonaceous black shale formed during the Cretaceous Period (~100 million years ago; photo by Y. Kashiyama and N. Ohkouchi). 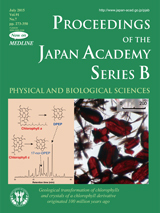 A review article by Dr. N. Ohkouchi et al., in this issue (pp. 273-291) describes crystals of a chlorophyll derivative originated 100 million years ago during black shale formation. The isotopic records of these alkyl porphyrins strongly suggested that the nitrogen within the porphyrins was assimilated originally through the biological N2-fixation process. The N2-fixing cyanobacteria, major N2-fixers in the oxic ocean, may have been a major photoautotroph and fed biologically available nitrogen in the surface ocean during episodes of black shale deposition. Because the Cretaceous black shales are major source rocks for petroleum and natural gas, our modern civilization could be supported by the solar energy once collected by the N2-fixers.